I keep my camera attached to my hip. I never want to miss a moment that might need photographing. I'm certainly not a pro by a long shot but love taking pictures and then playing with them over in PicMonkey. I consider myself a qualified caregiver. When I was around 37 years old I began overseeing the care of my paternal Grandparents. They had lived in Arkansas all of their lives and the time came that they needed to be moved into a nursing facility. My Dad, their only child, lived in Virginia and they did not want to move that far so they agreed to come here to Louisiana where I live. Little did we know that they would live a long, long time and I would be busy, busy overseeing their care. They were 80 and 82 when they moved here. My Grandfather lived 7 years and we just knew that my Grandmother would die within months as well. But, she lived an additional 7 years and died at the age of 94. She could be a force to be reckoned with and there were times that I did not know if I would be able to survive. They were just the beginning of my degree in care giving. My sweet MIL was stricken with Alzheimers over a period of about two years. She was able to stay in an assisted living facility until she needed a nursing facility. Hubby and I were the main overseers of her care as both of her daughters lived a long ways away. They came regularly and took as active a part as they possibly could but one can only do so much when a lot of miles are involved. I always made sure that she was receiving the best care possible at the nursing home and that meant running intervention a lot and serving as her advocate. Word to the wise: never, ever put your loved one in a nursing facility without staying on top of their care!!!!! She passed away on January 1, 2008. In June of 2011 my Daddy was stricken with Guillan Barre Syndrome and his life (and mine) was forever changed. He was 81 years old and looked and acted like he was many years younger. I spent most of the next 3 months by his side in the hospital while we did not know if he would live or die. I could absolutely write a book on the ups and downs of the 3 years that followed. I certainly never dreamed he would have made the recovery he has made. He lives happily at the assisted living facility here. He will never be what he once was, but then who is? ~wink~ He is the answer to a whole lot of prayers. My Mom had a massive stroke on Nov. 30, 2008 and died two days later on Dec. 1st. It took me almost 5 years to come to terms with her death. It was so hard for me to wrap my head around her death as it was so unexpected. I am very traditional in my home and its decor. I'm not one to step very far out of my box. I'm also very traditional in my dress and love to match from my head to my toes. And, I love to accessorize and like all things ultra feminine. I love Sonic's unsweet tea with cranberry flavoring and their popcorn chicken. Yummy!!! I love bacon and think everything is better with it. And, I love potato chips and thankfully I have a lot of self control or I could eat a whole bag at a time. I have salt cravings more than sugar. I love to be organized and like for things to be organized. For me, it makes for a very productive life. I am very punctual and appreciate punctuality in others. I love to be busy but not too busy. I like my "down time" as much as my busy time and I try to balance the two as much as possible and it makes for a happy gal! I LOVE internet shopping and much admit that I am addicted to Amazon Prime. Yes, even order my K-cups from there and I live less than 2 miles from the grocery store. It is just so, so convenient and quick. And, most every internet business makes returns simple, simple. It's a win win as far as I'm concerned. Well, I imagine you now know more about me than you ever cared to know but, hey, you didn't have to read this. ~I'm teasing~ I've had fun with these posts and hopefully you have had fun reading them and learning a bit more about this Southern gal. 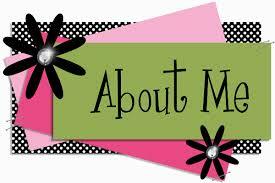 Even though I've known you yah these many years, I still enjoyed reading these "About Me" posts. I guess there is always something we can learn, but mostly I enjoyed reading your interpretation of your life. Thanks for sharing this. Lea.. great getting to know a little bit more about you! I am an Amazon Prime addict as well. I even use it to download movies on my ipad while I am on the dreaded treadmill. How lucky for your family members to have such a wonderful caregiver. It is not for the weak of heart. I, too, am an early riser and try to get my work done in the AM. Have a wonderful weekend - hope it's got some down time for you. I totally enjoyed this! We have several things in common starting with the 5:30 rising time. Don't know why I do that other then I just can't bear to waste the morning in bed, lol. Many people wonder how I earth I do it, but I tell them I bet I am "done" for the day (reclining in my chair or on the couch) LONG before they are. You are either a morning person or your not in my opinion. And us "morning people" get it. And then of course with the care taker role. You have done a whole lot more then I have in that area, but of course I am sure you remember the time caring for my mom while she lived here with me. SOOO much involved. I still miss her every day and I guess I probably always will. And I have always preferred salt to sugar. Not that I DON'T enjoy a sugary treat once in a great while. But passing up those chips? Much harder for me. Hate the TV on during the day as well. I find it depressive for some reason. And as for laughing...well I look for the humor everywhere. It does make life so much better. Enjoy your week end Lea! I love this list!!! I feel like you and I have SO many similarities. I loved reading about your role as caregiver. What an awesome thing you have done--a true service. I can only imagine how tough it can be to be a caregiver to family members ( my MIL is going through this wtih her mom and is having the hardest time right now...seeing her mom in that state and the true role reversal.) I try to give her encouragement, but I've never experienced it. I just try to tell her to "walk worthy" as best she can and give Him the glory even through the struggle. You have a very special and needed calling!!! Great post, Lea! Like you, I prefer organization. Clutter and disorder make me crazy!! You are and have been a wonderful caregiver. Those in your life have been blessed by you, I'm sure! I need to be more productive in the morning and then get on my computer. I've been doing it all wrong! What a wonderful caring heart you have and I love how you have helped your loved ones over the years. I've had the opportunity to help my aunt after my uncle passed away. She still lived at home but I would take her shopping, to get her hair done, to the bank, etc. It was a nice experience for me since my mother passed suddenly at 56 and didn't get to know her in her 80's. Thank you for sharing yourself. We haven't signed up for Prime yet but are thinking about it. However I do shop Amazon often and add things to my cart all the time. Well, Lea, I relate to you on many levels! Early bird, punctual, days filled with Christian music and seldom TV, lover of chips too. You sure have a tender heart as a caregiver and I am sure made those in your care much happier and better!